Yesterday I mentioned that my daughter was coming home from Copenhagen… but what I did not mention was that we kept the date of her actual arrival a secret from her Dad, Emile. Alexandra wanted to be home for his birthday (which is today) but she had told him that she was going to come home this Friday evening. Yesterday, Emile had planned to attend a friend’s party and I had to say I was not able to accompany him because I also had a meeting. What I did not say was that I would be “meeting” (read picking up) Alexandra at the airport. It was wonderful to see Alex walk through the door of the terminal! 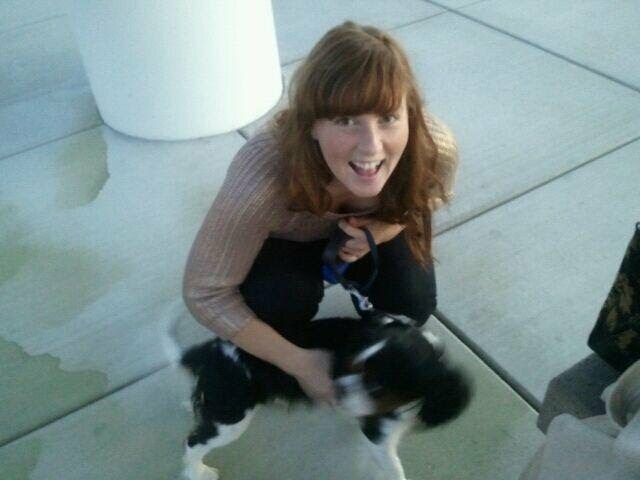 Immediately she introduced me to the furry St. Charles Spaniel that accompanied her. Alexandra has been caring for him for a while and there was no one else to assume that role, and so she brought him (Sofus) home. After a brief hug Alex went to the baggage carousel, while I walked Sofus. Once she had her bag, we drove to the party that her Dad was attending. She and I walked up to the door of the inn and then I asked her to wait while I looked around. The party was wrapping up when I found her Dad. He asked if I wanted a glass of wine and I asked if I could speak to him alone for a minute. At that point I took him to the front door at which point Alexandra stepped into view. The look on his face was priceless. He couldn’t believe that she was really there… and I was thrilled that we had truly succeeded in surprising him! This afternoon I baked a Blackberry Peach Cobbler for Emile’s birthday. 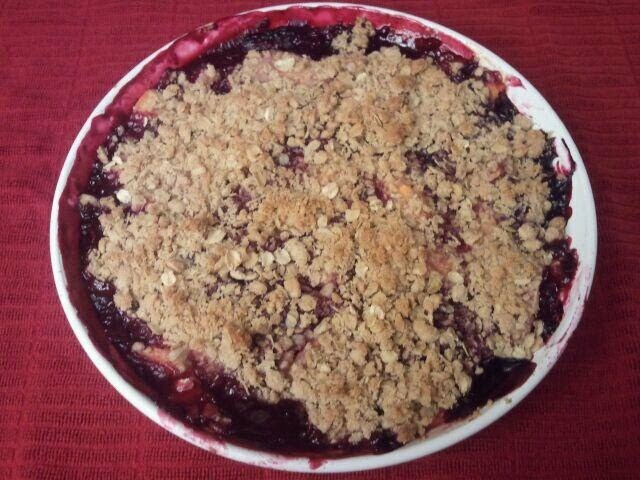 It was the healthiest “pie” that I could create – no crust, lots of fruit and oats in the topping. Please raise a glass to Emile tonight – and join us in wishing him a very happy birthday. What a wonderful happy birthday surprise for Emile! Congrats on the surprise and the fabulous looking pie! It was fun to finally surprise him! He usually senses something is up…. but not this time. Happy birthday, buddy! Know that between family (and pie) you had a great day…. Happy Birthday Emile!!! What a wonderful surprise! I hope you are having a wonderful visit! I am so loving your blog Karen! Thanks for sharing this journey with all of us.